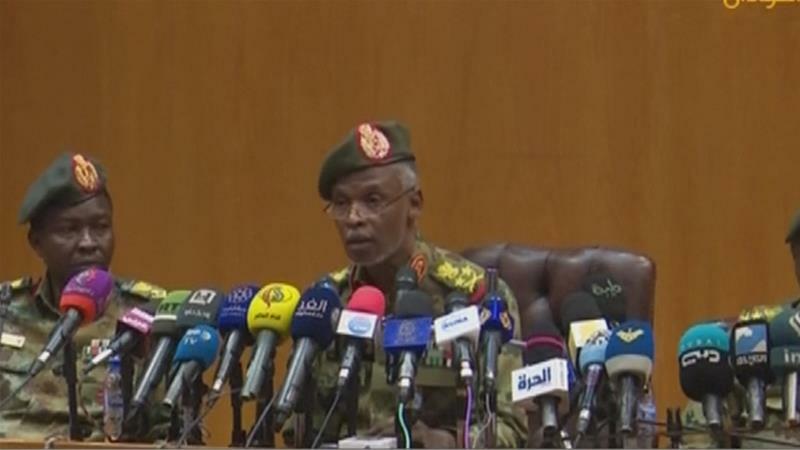 Sudan military: We have ‘no ambition to hold the reins of power’ The head of the military political council that overthrew President Bashir says new government will be run by civilians. The head of Sudan’s provisional military political council has said that the army has “no ambition to hold the reins of power”, and stressed that “we are ready to step down as early as a month if a government is formed”. Organisers of the months-long demonstrations that triggered the overthrow of President Omar al-Bashiron Thursday urged pro-democracy supporters to protest against a military takeover. “Stay put and guard your revolution,” it added. Defending the military takeover, Abideen said that it intervened to enforce “order and secuirty”. He stressed that the military acted to meet the demands of the people. “We are the protectors of the demands of the people and that is by consensus from the political entities,” Abideen said. His remarks came after Sudan’s opposition groups spearheading the months-long protests had called for people to rally after Friday prayers in front of the army’s headquarters. Abideen warned that the army will have “zero tolerance against any violation, and any misdeed to take place in any corner of the country. “We are here to provide an opportunity for the people of Sudan to achieve the change they have been aspiring to attain and to devise their own vision for the leadership,” he said. Protests broke out in December over steep hike in bread prices and and a deteriorating economic situation in the country. The latest round of protests began on Saturday, when thousands of protesters camped in front of the defence ministry building demanding Bashir’s ouster. At least 35 people have been killed in clashes with security forces in the past six days, the Central Committee of Sudanese Doctors said. It added that at least 13 people were killed when security forces intervened in Thursday’s protests. Al Jazeera’s Hiba Morgan, reporting from Khartoum, siad people have been marching towards the army headquarters despite the military council’s pledge to create a “healthy atmosphere” for people to converse and engage in a peacefull manner. “At the moment, these remarks do not seem to be enough,” Morgan said. “Their [protestors] whole point is that they don’t want anybody from the old regime or the former ruling party to be a part of the transitional council,” she said. “They are part of the old regime – so for the people who are on the streets, and for the thousands who have been staging a sit-in near the army HQ for the past week – it’s more of the same thing,” she added. Shortly after Abideen’s remarks, the SPA said in a statement that it “vehemently rejects” the outcome of Abideen’s press conference and vowed to resist the state of emergency and the curfew imposed by the military. “This is a rejection based on the experience of the Sudanese people in dealing with deception especially from the current regime,” the statement read. “The regime failed in creating a narrative that would weaken the protest movement and shake our unity … What happened was that the masks merely changed, it is the same regime that the people revolted against, seeking to remove it from its roots,” it continued. “Our demands are clear, fair and legitimate,” the SPA said, referring to their demand for power to be immediately transferred to a civilian government.